As I wrote about on Monday, the weekend was not great. After reading that post, a certain friend of mine who knows me well sent the following text: "...your blog is a good reminder of where I am in my cycle. 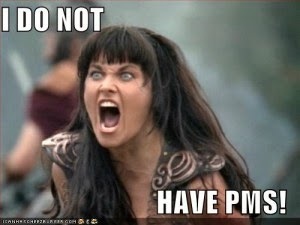 Still don't believe in PMS?!" I was so ticked off I almost texted back a lie about where I was in my cycle. The truth is, I had no idea. I don't really keep track (lesbian privilege). But I was certain my bumpy weekend could not be due to hormones. I was so wrong. Come Tuesday, I was a whole lot less grumpy. Sheesh. So, parenting project. Therapy. Still very much enjoying that hour per week all about me. Some friends asked what my therapist thought about this blog. I haven't told her. I don't want her to know she's one small part of a larger project! Is that weird? Tom wearing my Uggs and commanding us to "Talk to Ali!" Happiness Project dinner with friends. Harry overcoming shyness and speaking into a microphone at school assembly. It's a good life once the hormones settle down. Hmm… I have, once or twice, had the "period starts, feel much better" experience. But I've also had plenty of "feel much better"s which have been completely unrelated to my cycle. I'm sure hormones play their part but, in my case, I suspect they are only a small factor and the times things have coincided have been largely coincidental.